Jon Armstrong revived his dream of sharing the stages with the world’s very best drivers on November’s Wales Rally GB by scoring an all-important victory on the fifth round of the Carryduff Forklift Road To Wales competition. Navigated by Noel O’Sullivan Jnr, the 20-year-old led from the second stage until the last to take the win by 32.8 seconds. 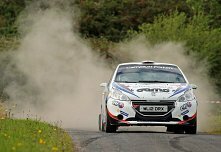 He capped off an unforgettable forty eight hours by winning the top two-wheel-drive award, with Ulster Rally organisers also presenting him with the Young Achiever trophy. 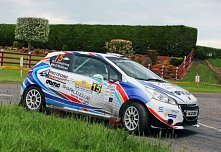 Last Saturday’s Tyrone Stages Rally marked the mid-point of the Carryduff Forklift Road To Wales competition, which has been created to give one lucky driver the chance to win a free entry and fully funded drive on November’s Wales Rally GB – the closing round of the World Rally Championship. 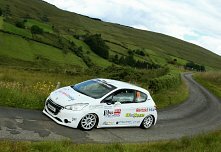 Peugeot 208 team-mates Jon Armstrong and Noel O’Sullivan Jnr returned to winning ways on the third round of the Carryduff Forklift R2 Wales competition as they recorded a sixteen second victory over second-placed R2 driver Rob Duggan at the Ryan Bradley Memorial Tour of the Sperrins Rally.